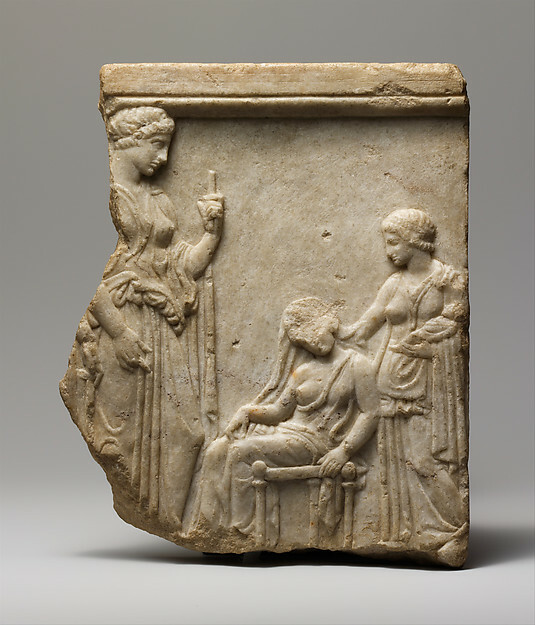 This marble votive relief fragment is an offering to the healing Greek gods Asklepios and Hygieia. The scene depicts a mother at the center resting on a chair, while her nurse, behind her, tends to the newborn. The large goddess to the left watches over the mother and child keeping them safe. Ancient childbirth often resulted in the death of the mother or child. In this scene the mother and child are both alive postpartum; therefore this sculpture is an offering of thanks to the healing gods of ancient Greece. A perfect object in Janson’s History of Art that could be replaced by this votive relief is the Grave Stele of Hegeso (Fig. 5.48). When compared to the relief, the drapery of the clothes and the way the human bodies are shaped are most definitely the same style. The viewer can see the similarities in the way the hands are depicted, the way the female form is shown, and the way the clothes are draped over the characters. In both works the viewer can clearly see that the hands of the women are very boxy and almost rectangular. The woman on the right in the Stele and the woman on the left in the relief, are holding their hands in the exact same position, and they look almost identical. One can also see similarities in the way the female form is depicted. In both works all of the female character’s breasts are very pronounced, and for every character one breast is more pronounced than the other. The viewer can also look at the effect of the drapery of the clothing on the human form. Both of these artists use wet drapery to place the clothes on the human form, and this makes the scene more naturalistic. Both the Grave Stele and the relief are great examples of late 5th century sculpture and the traits that characterize the High Classical period. The relief sculpture also adds more than just a representation of High Classical style. It can be seen as a distinct insight into the dangerous reality of childbirth in ancient Greece, and be very crucial to understanding the relationship between the Greeks and their Gods. One can see the respect and fear the Greeks have through the sculpture, and how the Gods were thought of as the protectors of the people. This work would be an excellent addition to Janson’s History of Art because of its historical context, and insight into the ancient Greek culture. 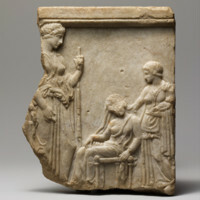 “Marble votive relief fragment of goddesses, mother, nurse, and infant,” accessed April 22, 2019, http://metsurvey.kenyoncip.org/items/show/20.